Hayward’s Royal Market was the scene of a robbery on Tuesday, and it’s getting a lot of attention because of the video that people saw afterwards. Surveillance cameras captured a 15-year old gun-toting robber run into the store around 8:45 p.m., and force one of the clerks to the cash register. 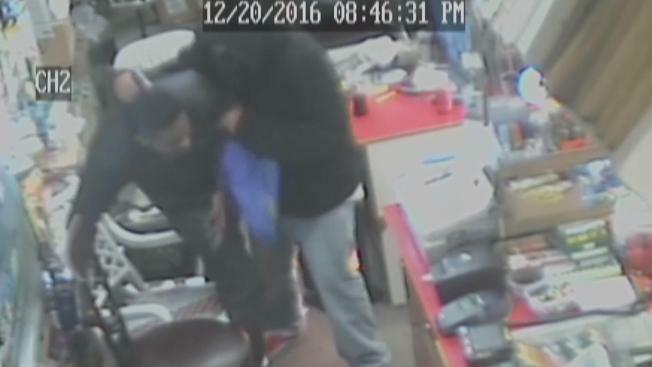 The video also shows a second clerk, brother to the first, sneak up behind the robber, and then clamp his forearm around his neck. The three scuffle to the floor, the gun goes off, and the two clerks, one of whom was actually shot, beat the would-be robber and used his firearm to pistol whip him. One of the customers called 911, and by the time Hayward authorities, they had to put the teenager into a neck brace and onto a stretcher. The shot that went off hit one of the clerks in the leg and the other sustained major damage to his hand. Hayward law enforcement officials are not endorsing what the brothers, but say they understand they might not have had a choice. When asked if he would react the same way again, Amit Prasad, one of the clerks, replied: "If I have to, yes. If someone's life is in danger." The clerks were back at work Friday, while the robber is booked into juvenile hall. "Everybody knows them. If people don't have much money, they'll let you come back and pay," said customer Naomi Thomas. "Why would you rob a local store?"